I do this spread daily. I got it from Rachel Pollack (got myself a reading from her a few years ago) but it’s been adapted a bit through use in the chat room – this isn’t strictly the spread she introduced to me. 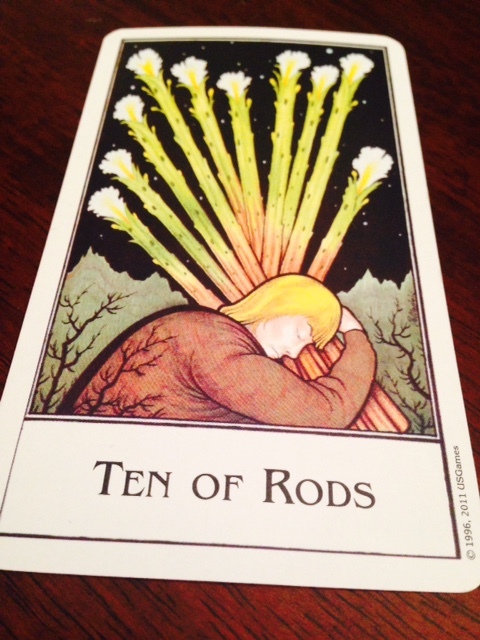 And this morning my DO was the Ten of Wands. Always interesting when a “bad” card – what we think of as bad – is our advice. I mean, wouldn’t you rather see Empress, Star, Ten of Cups, Three of Pentacles? Ten of Wands. Okay. Seven of Wands (battle) as the DON’T. Eden Gray has a cluster of bummer meanings before getting to the good one: PROBLEM SOLVED. carrying a burden of ill-regulated power. Hmm. Pluto IS opposing my Sun. Refining test by fire (she writes). Heart tried by pain. Sounds about right under my transits AND/OR this Saturn Neptune sky. What transits are you under? Are you seeing any Tarot TENS? And Your Advice For The Weekend Is…. I recently did the ladder spread again. My top of ladder card, where I want to be, was the ten of swords. How to get there? The eight of swords. It’s all actually very appropriate. I need to let one dream die so I can commit to another and let it grow. My how to heal what holds me back card was the empress. Part of me needs to die, but another part is being birthed. Also makes sense because of my transits. Pluto still in my 11th on my stellium. And Mars opposing my natal Mars 3 times. Ah the Ladder!! I should create a new spread … Mars opposition 3 times…….. !! !